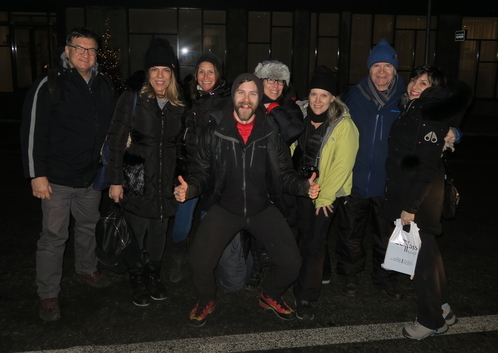 As I mentioned in this post, I spent New Year’s in Reykjavik, Iceland, with friends. I normally celebrate my birthday with family on the actual day (December 23) and then have a combined New Year’s Eve/birthday celebration with friends. However, this year — as you may recall — was a big birthday. Here’s the Iceland group with our fantastic tour guide, Svavar, from Arctic Adventures. From left: Petros and Anastasia (all the way from Greece! ); Alyssa; Svavar; Stacy; Tina; MrB and me. We didn’t get to see the Northern Lights due to weather and a crazy-bright moon, but I still enjoyed the 10:30 a.m. sunrise and 4:30 p.m. sunset. Bustling around for hours before the sun came made me feel like I’d gotten up exceptionally early. I felt so industrious, and on vacation no less! 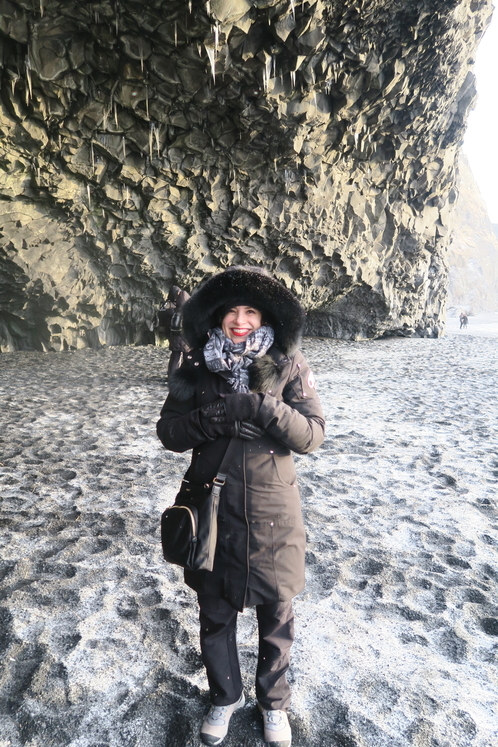 Some people who saw my bundled-up photos on Instagram exclaimed over how cold Iceland looked. This outfit took me from a windy, black-sand beach to a hike on a glacier. I’ll share some glacier photos in another post. Stay tuned! Mr C lived in Iceland for a year as a Fulbright scholar and I loved my NYEve visit. The pyres! He had rented us a house on the water and we were given a number to call if our roof blew off. It didn’t, I’m happy to say. Looks like your trip was spectacular, and belated Happy Birthday! ” we were given a number to call if our roof blew off” – That. Is. Highlarious. Please add MAC lipstick to your outfit description because only you can pull that off! Plus, it stayed put hiking a glacier and scrambling through an underground cave! Also — my anti-spam word is donuts. You need to add cinnamon bun! ?